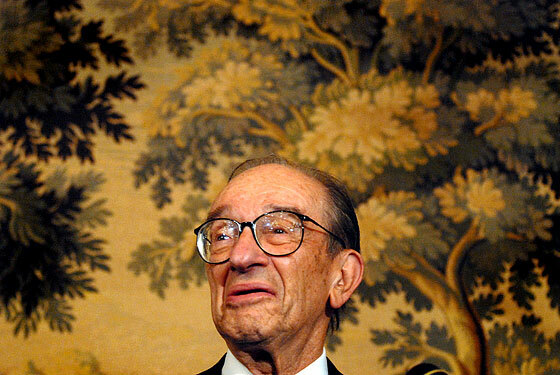 You are currently browsing the tag archive for the ‘Alan Greenspan’ tag. I understand the furor over the AIG bonuses. Not only do they go “against our most basic sense of what’s fair, what’s right, it offends our values,” but they also are symptomatic of a system in serious need of fundamental change. And everyone is outraged over them, from the President right on down to the homeless guy out in front of the McDonalds by where I work. But are we so “outraged” that we are losing sight of the big picture? Afterall, the bonuses, though outrageous and boneheaded, are really an insignificant piece of the bailout money they’ve recived. The $165 million in bonuses is only one-tenth of one percent of the $180 billion they recieved in bailout money. The psuedo-populist rage that exists now originated with the Republican party, eager to shift blame onto President Barack Obama. When President Clinton left office, the national debt stood at $5.73 billion; when President Bush left office, the national debt stood at $10.66 billion. 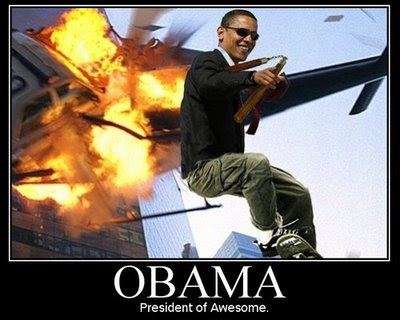 Not only did he double the national debt, but he also accumulated more debt than any President in American history. Some analysts predicted before the current fallout that the national debt would rise to as much as $2 trillion dollars. With President Obama’s stimulus packge and soon-to-be budget those figures are going to rise dramatically. The GOP is trying to take advantage of American’s collective amnesia. So far, unfortunately, it is working. The party that is now screaming at President Obama to be fiscally responsible was the party, over the last eight years, that spent money like it was going out of style. President Bush did not even use his veto-power until the Democrats came into power in 2007. The sage Alan Greenspan, who recently stated that he was wrong to believe that the financial institutions would self-regulate, also famously admitted, in his book Age of Turbulence, that he had been angered by the Republican’s attitude that “deficts don’t matter.” His advice to President Bush, just as it was under President Reagan, to exercise fiscal responsibility was completely ignored. This attitude not only caused him to leave his position as Federal Reserve Chairman, but it also caused him some measure of happiness when the Republicans were swept out of power. To the surprise of many, this long-time Republican wrote that President Clinton (a Democrat) was far more fiscally conservative than any of the six presidents he worked under, and that he appreciated Clinton’s efforts to slash deficits and reduce the national debt. President Clinton was putting together a budget hat would increase taxes on th rich, spend more money on important programs, and cut the budgets of programs that were not working. So called fiscal conservatives were outraged by President Clinton’s “tax and spend” budget, but what they missed was the fact that he was implementing short-term growth, but he was also preparing for long-term sustainability of that growth. That is exactly what is happening now under President Obama. Yes, he’s having to spend a lot of money, but he is also investing in long-term growth that will raise the American economy out of the depths of this recession. But I’m geting ahead of myself. The AIG bonuses have distracted people from the overall picture. The American public, thanks to the GOP and the “Pro-Obama” media, have been worked up into a frenzy over a semi-irritating story. The reality is that the bonuses were included in the original bailout deal that was worked out in November 2008… wait… who was President in November? Within the original bailout agreement, AIG was allowed to payout retention bonuses to its prized employees, which initially totaled $469 milion (according to an SEC filing by AIG). In a November 2008 HuffingtonPost blog by Representative Elijah Cummings (A Bonus by Any Other Name Still Stinks), he wrote that “the company’s executives will be receiving ‘cash awards’ as ‘retention payments.’ AIG can dress this money up in fancy names, but no one is fooled. A bonus by any other name still stinks.” So, clearly, this was not a process that was clandestine or otherwise kept from the public. And, again, this was known before President Obama came into office. The public, as usual, was not paying attention. And, again, the public is not paying attention. They are distracted by their own “outrage” over the AIG bonuses. And President Obama is reaping all the blame that belongs to President Bush and the GOP. In February, as the Stimulis Bill was making its way through congress, an amendment was added to the bill which would allow companies that recieved bailout money to provide bonuses to “valuable” employees. According to Senator Chris Dodd (D-Conn), Treasury officials came to him and insisted that he insert the amendment into the Stimulus bill. Apparently, the move was an effort to prevent lawsuits against the government from employees who were contractually promised bonuses. As Rep. Cummings noted, their bonus is keeping their job. The President, who may or may not have been aware of the added amendment, has also expressed “outrage,” yet he has urged Americans to keep their eyes on the big picture. The bonuses, he remarked, though distateful, are an unfortunate and neccessary pill to swallow. Just tonight, in fact, the Congress has passed a bill which places a 90% tax on those individuals that recieved bonuses. President Obama has indicated that he will not sign the bill. Secretary Treasury Tim Geithner has also said that he will deduct $165 million from the already planned additional $30 billion going to AIG. Hopefully, this story loses its legs soon. Its nothing more than a distraction and an attempt to bring down President Obama’s numbers, which are still high. According to Gallup, President Obama enjoys a 65% approval rating, despite the gloomy economy and the furor over the AIG scandals of late. The American public, despite GOP efforts, still trust President Obama and still have a lot of hope for his presidency. As President Obama said during his 60 Minutes interview, he is feeling the heat, as many bad choices made over the last few years (before he was President) are forcing him to make decisions that narrow down to “bad and worse”. He, nonetheless, continues to be steady, confident, and eloquent in his ability to convey his message to the American public. In the last week, he spent two days in California– a visit that included a stop on the Jay Leno show. Tonight the 60 Minutes interview airs, and later in the week he will make a televised appeal to the American people in order to rally support for his budget. This generation’s “Great Communicator” has a lot of explaining to do.